DAVID LE. Gloucester Times. 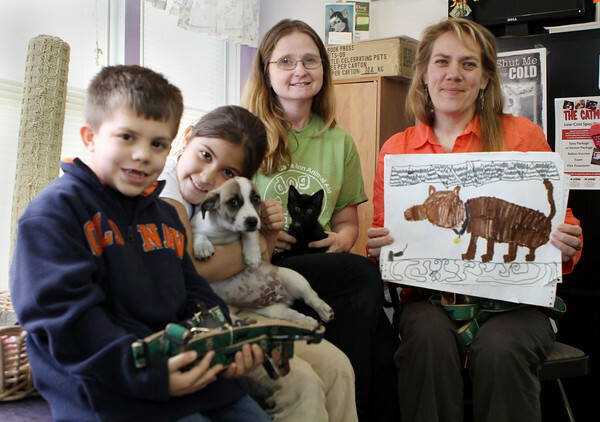 Matt Fuller, 7, and Hiassa Scherr, also 7, of Pathways for Children, hold leashes and a puppy while Cape Ann Animal Aid PR Coordinator Nancy Tarbox holds a kitten, and Executive Director of Cape Ann Animal Aid, Sunniva Buck holds up some drawings the children did. Pathways for Children donated leftover leashes from a fundraiser they held two years ago to the Cape Ann Animal Aid to use. 4/22/11.